In case you have lived under a rock for the last 6 weeks, the biggest fight in UFC history goes down in just a little over a week. Conor McGregor and Khabib Nurmagomedov headline UFC 229 from the T-Mobile Arena on October 6th. McGregor looks to regain his spot at the top after dabbling in boxing against all-time great Floyd Mayweather, while Khabib looks to run his undefeated record to 27-0. 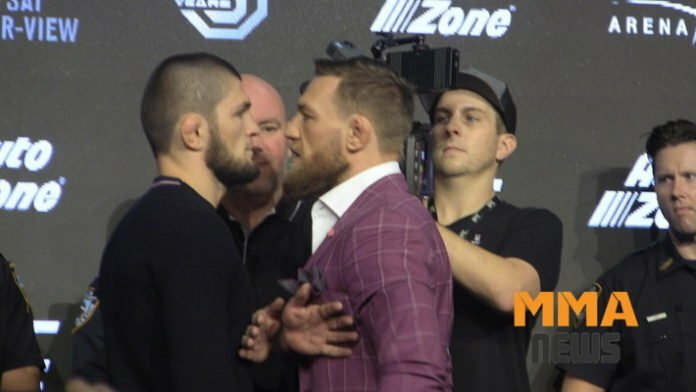 If you watched the Press Conference last week, you know that it is no secret that there is a lot of animosity between these two men and there is a lot more on the line next Saturday than just the UFC Lightweight Championship. If you are anything like me you may dabble in a wager or two and are always looking to get the edge whenever possible. What better way to get emotionally invested in a fight than being financially invested? There is no doubt that the Main Event is the fight everyone is going to want to bet on the 6th. Will Khabib just maul Conor with his grappling like he has all of his other opponents? Will Conor be able to land his left hand early and end it? Currently Khabib is a -160 favorite and Conor is the +130 dog, but don’t be surprised for there to be a switch as the fight nears. McGregor has a monster fan base who will turn the odds to his favor during fight week. My advice? If you are betting Khabib, wait it out. If you are betting Conor, jump on it now before it’s too late. The Main Event is massive, but you can’t sleep on the rest of the card. Specifically the Co-Main Event that puts former Interim-Champ Tony Ferguson against for Champ Anthony Pettis. A fight that should be for the number one contender spot. When it comes to betting for this contender fight SBD’s toplist has you covered, in terms of finding the best book with the best odds around. Even after the injury and a year layoff Tony Ferguson is a monster -275 favorite, so I won’t be going near that. Instead I am looking at some of the prop bets. Specifically the over/under on rounds and the method of victory. Both guys have had submission success and only three of their combined last twelve fights have gone to decision. A parlay of the two may be your best bet. October 6th can’t come soon enough. Make sure to stick with MMANews.com as we continue the buildup for the biggest fight in MMA history.